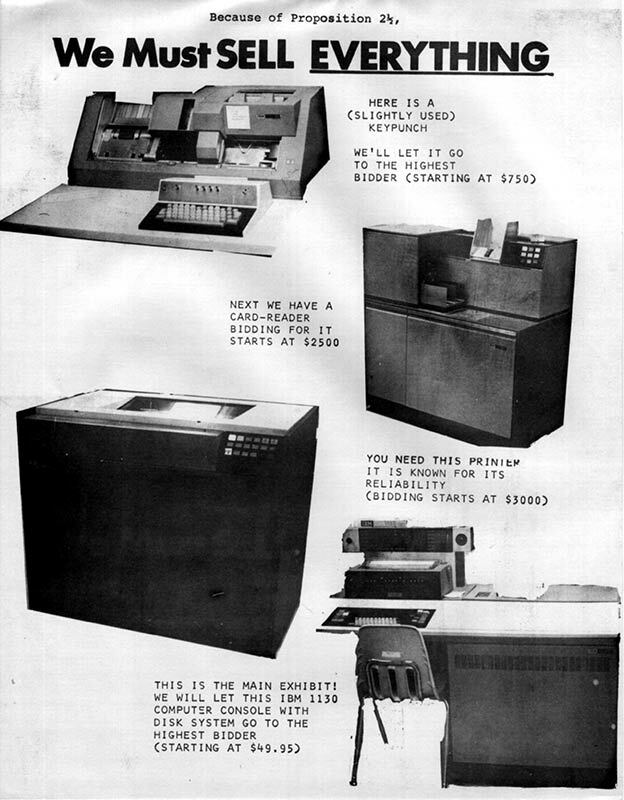 The IBM 1130 is a small (floor-standing desk size) computer released in the mid-1960s. It was intended for business and scientific use. The original press release is available, as is the technical press release. I'm effectively finished with the IBM 1130 Functional Characteristics manual now. I can see doing further proof-reading, and maybe rebuilding more of the graphics from scratch. If you have specific requests, please let me know. As it is, I'm looking at the weblogs and checking the images which are most viewed. I'm done with IBM 1130 Disk Monitor System, Version 2, Programming and Operator's Guide . There are a few indicies I decided not to do. If you want them, request them specifically. Someone (you know who you are) wanted better pictures of the 1130, so I've found and posted an "ad" I did as an assignment for print shop in high school. Hey, the darn thing kept breaking. As of 1982, this wasn't too surprising. This little (for 1965!) machine has a few web sites dedicated to it on the web. The Vintage Computer Forum IBM itself has created an IBM 1130 web page with details unavailable elsewhere. Annoyingly, IBM seems to have produced a printer with the 1130 model number at some point. Many Google matches come up for this printer's supplies. Shame on you, Big Blue! You had lots of other numbers you could have used. IBM lawyers: please e-mail me if there's something I'm doing which IBM would prefer me to either not do, or do differently. I'm not into copyright violation. I am into documenting the machine this page is about. If you are or were on an 1130 project team, please contact me as listed below. If someone from the original IBM 1130 development team contacts me, I think I'll pop. Then I'll try to get any information the person remembers, and put it on this site. So if you fit that description, please contact me! Note: I've now heard from a few of the people involved. It's now a matter of them having time to recount 40 year old memories of this project. If you have an IBM 1130, I'd like to know about it. Specs, condition, peripherals, software, location, ... availability.... :-) Oh, and it would also be good to know if you'd like to be mentioned here. There just can't be many of these machines around anymore.